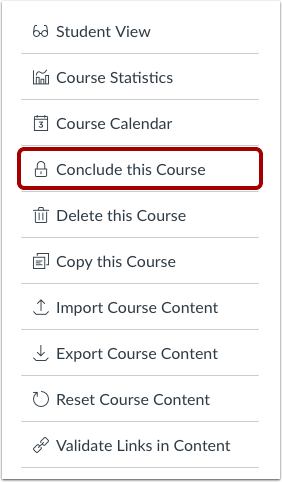 When a course is completed and you want to provide read-only access to the course, you may be able to conclude the course manually in Canvas. However, if your institution uses software that automatically concludes enrollments, you do not have to manually end your course since the end date of the course will automatically conclude the course on your behalf. When courses are manually concluded, all enrollments are removed from the course and placed in the prior enrollments page. 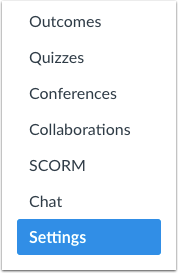 All users in the course will have read-only access. This change applies to all enrollments, including course instructors. Instructor-based roles will no longer have the same access in the course and will result in loss of course functionality and user information, such as viewing SIS data. If full functionality is still required for instructors but you want to conclude the course for students, learn how to change the end date of your course instead. Once a course is concluded, if you do not want students to be able to view the course at all, you can restrict students from viewing prior courses. Note: Manually concluding a course is a course permission. If the Conclude this Course button does not appear in Course Settings, this setting has been restricted for your course. To conclude your course, click the Conclude this Course link. Verify that the course has been concluded. Note: Admins can unconclude courses if necessary. If you are an instructor, please contact your admin for assistance. Previous Topic:How do I publish a course? Next Topic:How do I manage content for a course associated with a blueprint course? Table of Contents > Courses and Sections > How do I conclude a course at the end of a term as an instructor? Re: Can I remove myself from classes from other terms that I still appear to be "enrolled in"
Re: Isn't there a way to filter the Canvas Commons import destinations?